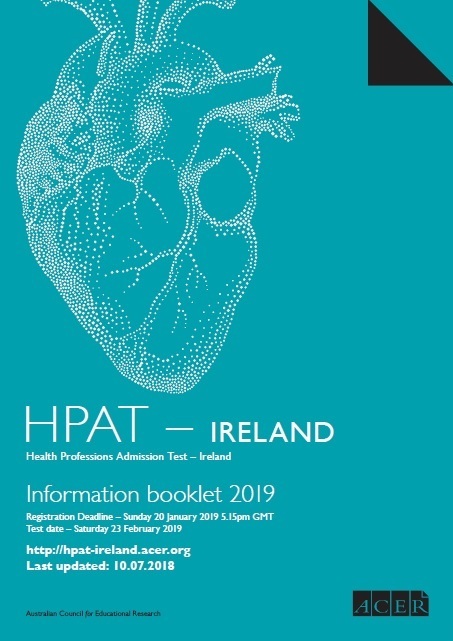 The HPAT – Ireland test is a 2½ hour paper-based test consisting of three sections. Each section is separately timed and there are no rest breaks between sections. The questions are in multiple choice format with 4 or 5 response alternatives from which you are asked to choose the most appropriate. Each question has only one correct response. Questions in sections 1 and 2 are in written form (though some section 1 questions may present information in visual or tabular format). Section 3 questions are based entirely on visual material. IMPORTANT NOTE: In addition to completing HPAT – Ireland, candidates applying to the MSc Occupational Therapy (Professional Qualification) and the MSc Speech and Language Therapy (Professional Qualification) at the University of Limerick are required to sit a 1 hour Written English component. See below for details. The following table shows the structure of HPAT – Ireland by section and time. Materials in this Section are drawn from a wide variety of general sources and are based on a brief text or piece of information presented graphically. Questions assess your ability to comprehend, draw logical conclusions, reach solutions by identifying relevant facts, evaluate information, pinpoint additional or missing information, and generate and test plausible hypotheses. Section 2 assesses the ability to understand and think about people. Questions are based on a scenario, dialogue or other text representing specific interpersonal situations. Most passages will have several questions.The questions assess your ability to identify, understand, and, where necessary, infer the thoughts, feelings, behaviour and/or intentions of the people represented in the situations. Questions in this Section may be of several kinds. All are based on patterns or sequences of shapes and are designed to assess your ability to reason in the abstract and solve problems in non-verbal contexts.